Judy She-nanigans: Post-Salabrasion - UPDATE!! I've spent a lot of time in my head and it's safe to say that i'm not exactly a "normie". But life is funner that way so here,at least, you'll get a peak into my crazy, wonderful, stressful, beautiful life. We'll cry, we'll laugh, we'll chuckle...maybe slap our knees proclaiming the funny insanity in my mind. It's 50% sure to be moderatly awesome. So, I got a message recently about posting update salabrasion pictures. I want to apologize to that person....SO very sorry. We were in the middle of mid-terms, now we're closing in on finals and I've just been WAY busy. Really, you have no clue but I thank you for understanding. I mentioned to that person that, once classes started, I realized I wasn't going to be able to keep up with this blog. I just don't want to delete it because of that info on salabrasion. Ok, this was a few days after the "procedure". It was very sore and raw. I took pain medication for about 2 days afterwards. We were constantly dressing and re-dressing the area. I made sure not to get it wet, sweaty or dirty. We'd really just put a disinfecting cream, and cover it. This was on my neck so my hair would get the tape unsticky...it was a pain (annoying). I admit, I was worried when I saw that the tattoo was still visible like this. But it DOES start fading. I actually think that our re-dressing it actually slowed the scabbing process but who knows. This was about 2-3 weeks post-salabrasion. 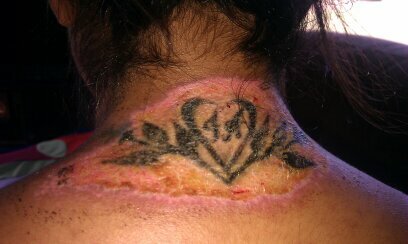 You can see it had started to scab (crucial to healing) but this was honestly the worst! It got SO itchy! You know how you scab your knee or elbow and you want to scratch or pick at it? Ok...imagine wanting to pick and scratch this big area! I caved 2-3 times and I even feared my scratching would lead to an infection but, thankfully, everything was fine. Still, one must be prepared for this. It NEEDS to scab....NO scratching!! Sorry for the size on this one (above). This was almost 2 months after. Still visible and actually, still healing at this point. You see that it hasn't actually started to "scar" yet. The layer of skin is forming here, making it looks glossy but this isn't the scarring yet. It's still fading too. I doubt it's going to fade any more than this. As you can see, someone missed a little piece but that's okay. This is with ONE salabrasion treatment, less than $30, but very painful and not for the faint of heart. This is WITHOUT any sort of fading cream. I am going to start using one this week to get rid of what's left. Honestly, we'll probably do one more session just on that little piece. I knew I would scar badly but I preferred that over the tattoo. I've got things to achieve and it was holding me back from a particular goal. I can now move forward. I do not regret doing this at all. Questions?? Feel free to message me! I'll do my best to respond asap! I hope this finds you well! My name is Raina, and I work for a health talk show on CBS. We are interested in getting your permission to use your pictures. Do you have an e-mail where I could contact you further about this and give you more details? Thank you for your quick response! I'm planning on starting the process soon, hopefully video documenting the process. I just did this seven days ago on a tattoo I got on my breast. 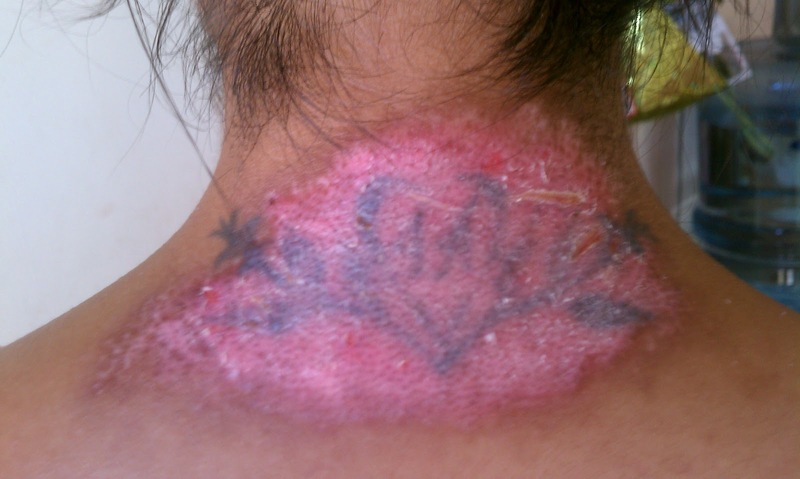 This method of tattoo removal is definitely not for the faint of heart lol. The pain I felt the day after was beyond horrific, I thought I was gonna pass out lol. Thank you for this very insightful and helpful blog. I was looking for blogs that had women who had went through this salabrasion procedure and your blog was the only one, thanks a lot. I took pictures of what it looked like right after and some more just a day ago. 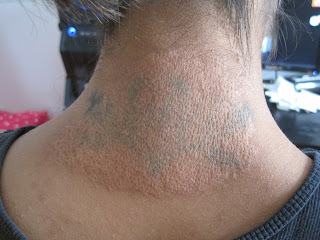 I was thinking about posting my healing progress for people who want to know how it looks on darker skin tones. Thanks once again for documenting your experience and sharing it. Could you post a pic of what it looks like now that it's been about 5 years? I'm curious to see how much the scar has faded. Hi I have done salabrasion and dressing it every alternate day after how many days should I stop dressing it. hi, I've finished 1 session today on my left hand (lettering on my fingers) and it's not that bad. I'm hopeful my attempt will leave noticeable results after scabbing/ healing processes. We are glad to announce that in COEPD we have introduced Digital Marketing Internship Programs (Self sponsored) for professionals who want to have hands on experience. In affiliation with IT companies we are providing this program. Presently, this program is available in COEPD Hyderabad premises. We deem in real time practical Internship program. We guide participants through real-time project examples and assignments, giving credits for Real-Time Internship. Our digital marketing certified mentors tutor our learning people through modules of Digital Marketing in an exhaustive manner. This internship is intelligently dedicated to our avid and passionate participants predominantly acknowledging and appreciating the fact that they are on the path of making a career in Digital Marketing discipline. We upskill and master the nitty-gritty of the Digital Marketing profession. More than a training institute, COEPD today stands differentiated as a mission to help you "Build your dream career" - COEPD way. I HAVE A TATTOO UNDER MY EYE I WANT REMOVED. BUT I FEAR THAT IF I FOLLOW YOUR METHODS I WILL BE LEFT WITH PERMANENT DISCOLORATION UNDER MY EYE. HAD IT BE AMYWHERE ELSE ON MY BODY BESIDES MY FACE I WOULDN'T CARE. BUT ITS ON MY FACE SO IM SCARED. WHAT SHOULD I DO AND WILL IT LEAVE A UGLY DISCOLORATION UNDER MY EYE IF I DO THE SALBRATION TREATMENT?